The Dentrix Mail Merge feature allows you to generate lists of patients who meet specific criteria. Those lists can be easily imported into YAPI as Interest Lists to be used in your e-mail campaigns. In this article, we will show how to export the list of patients with remaining insurance benefits from Dentrix, import it into YAPI, and create end-of-year Use It or Lose It e-mail campaign. On Patient Filters tab select Dental Ins. and enter Remaining Benefits range; check Prim. Ins. and Sec. Ins. Then select Appointments, enter Date Range, select Existing Patients with No appointments in date range. Switch to Data Fields tab and check Last Name and First Name data fields. No other data fields should be selected. Click the Ok button to close Patient Report View. Wait until the list is created. Click Setup toolbar button, and select Manage Interest List. 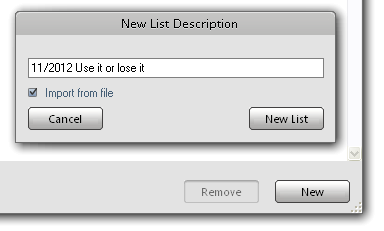 Click the New button, then enter list name and check Import from file box. On the Import Interest List window click Browse button, navigate to a folder that contains data file created by Dentrix (typically in Dentrix’s DocFiles\EXPORTS folder ), select data file. Select Tab as Separator and click Load button. YAPI loads data and shows the number of records processed. Select FName and LName, select yourself from provider list, and enter list details. Click the Process button. YAPI may show you a warning message. Click Yes to continue. It may take several minutes to finish processing. First, you need to create an email template for your campaign. Go to Manage Documents and Templates to create a new template. Click here to download the above template. Do not unzip, save on your local hard drive. To install, just follow instructions. Go to Interest List tab and select interest list. Click the Search button. Once patients’ list is loaded click With email box to select patients with email. To initiate an email, click the Email button. Enter Subject and select email template from the list. Click Send. Note that you can mail a postcard to all patients that don’t have email: select Without email box and click the Print button.